Okay guys – I may be in need of an intervention. I’m out of control with pumpkin right now. In fact, I was just browsing through the recipes in my drafted posts, and every. single. one. has pumpkin in it. What I’m trying to say is that if you loathe this particular holiday ingredient, ya may want to just stay away from MBA for the next week or so. Sorry. So insane pumpkin obsession aside, you guys know that I also have a thing for cheesecake. So it was only natural to combine two of my absolute favorite things to create one incredible Thanksgiving dessert. The first time I tested this recipe, I used gingersnap cookies for the crust. However, I didn’t actually taste the gingersnap cookies that I purchased before whirling them up in my blender. Well, they tasted quite unfortunate. Sort of like a how I imagine dirt would taste if you sprinkled some spices on it. Sick! Moral of the story? Stay far away from Kroger brand gingersnap cookies – unless of course, spicy dirt sounds appealing. After trashing the first crust, I went the more traditional route and used graham cracker crumbs, but I added a little somethin’ somethin’ to the mix – homemade pumpkin pie spice. And honestly, the flavor was just perfect! 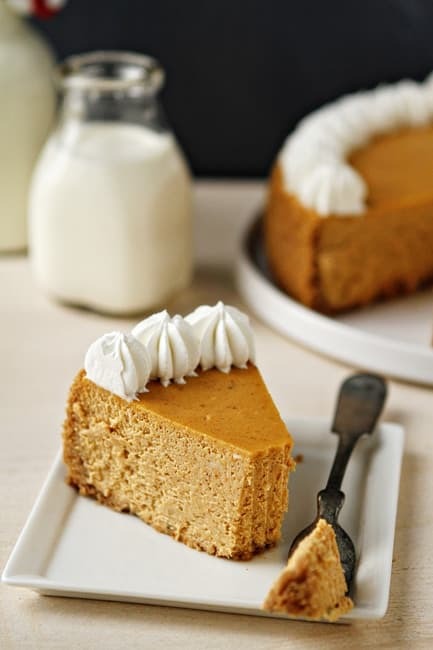 Whether your looking for the perfect dessert for Thanksgiving dinner, or you’re just freakishly obsessed with pumpkin, this fantastic Pumpkin Cheesecake is sure to please. Simple dollops of whipped cream finish this baby off so that you can look impressive – even if you’re hiding in the kitchen necking the Reddi-Whip dispenser like it’s your J-O-B. It can’t just be me. Right? If cheesecakes scare you a bit, no worries. Check out my video tutorial on How to Make the Perfect Cheesecake! It’s old school – enjoy! Snickers Cheesecake How-To from My Baking Addiction on Vimeo. 1. Preheat oven to 350°F. Line the bottom of a 9-inch springform pan with foil and spray lightly with nonstick cooking spray. 2. In a medium bowl, combine graham cracker crumbs, butter, granulated sugar and pumpkin pie spice. Press onto bottom and 1 inch up side of prepared pan. Bake for 7 to 8 minutes. Cool on wire rack for about 10 minutes. 4. In the bowl of a stand mixer fitted with the paddle attachment, or in a large bowl with an electric mixer, combine cream cheese, granulated sugar and brown sugar until fluffy; about 3 minutes. Add in eggs, pumpkin and heavy cream, mix until fully incorporated; scraping down the sides of the bowl as needed. Finally, add in vanilla and pumpkin pie spice and mix until well combined. 6. Bake 60 minutes, the edges will appear to be set, but the center will still have some jiggle to it. At this point, close the oven door, turn the heat off, and let rest in the cooling oven for one hour. After one hour has passed, carefully remove the cheesecake from the water bath and place on a cooling rack to cool completely. Once the cake is completely cooled, place it into the refrigerator for at least 6 hours. - If you don't want to mess with the whole waterbath situation, no worries. You can bake the cheesecake without it. If you end up with a crack, just cover it with whipped cream! - A tightly covered cheesecake can be stored in the refrigerator for up to five days. The cheesecake can be stored for approximately 2 months in the freezer. To defrost, allow cake to defrost in the refrigerator overnight. A couple of things I picked up from Cooks Illustrated and various web sites: Spread your pumpkin on a baking sheet lined with multiple layers of paper towels to absorb the excess water that’s a part of canned pumpkin. You can repeat the process a couple of times if you want. If the “doneness” of a cheesecake (slightly jiggly) baffles you as it did me, use a digital thermometer, insert into the middle and if it reads 150 degrees, it’s done. A lot of times the cracks are a result of overcooking. After you take it out of the oven to cool, run a thin bladed knife around the edge to separate it from pan; cracks are either created or made wider as a result of the cheesecake contracting as it cools. Finally, one reason the crust sticks to the bottom is because the butter has hardened while refrigerated. Place the pan on a towel you’ve run under hot water and rung out, for a minute or so, to soften the butter and make it easier to separate the crust from the pan. Thank you so much for stopping in to share all the tips! Have a great day and thank you for following MBA! That’s awesome! Thank you so much, and have a wonderful day! I just noticed that in your video while you explain how to make the cake you changed the recipe and instead of 3 eggs you mention 4, also you say 3/4 cup of heavy cream instead of 1/3 cup as the recipe says and you talk about 1cup of sugar but not mention 1/4 cup of light brown sugar. Can you clarify the recipe to have success with this recipe? The video was there as a preparation reference (water bath, etc. ), not for the recipe. The directions for the Pumpkin Cheesecake are as indicated within the recipe print box. I hope this helps. I’m about to make this recipe as my first cheesecake ever! I’ve been looking up cheesecake tips and I was wondering what you think about them: 1) Prebaking the crust for 10 mins 2) Adding the eggs into the batter last 3) Adding cornstarch to the batter with the sugar. I’ve never heard those tips before, but I’d sure love to hear what you think of them if you try them. I just wanted to tell you that I just finished watching your video, & it was GREAT ! I think you have a very good way of “teaching”. I look forward to your recipes on your blog. Thanks ! Your video was very helpfull, thank you. I’m happy that you enjoyed the recipe. Thanks so much for sharing your experience. Happy holidays and thank you for following MBA! If you want to make a cheesecake without a water bath, put a baking pan with water (just an inch or two) on the rack below your cheesecake. When baking time is completed, turn off the oven, prop the door open slightly (a wooden spoon works) and let the cake cool for a couple of hours in the oven. About an hour into the cooling process, I also slide a knife around the cake to separate it from the pan. Using these tips, it’s been years since I’ve had a cracked cheesecake. I’ve never used a water bath. I love that this cheesecake is simple! So many pumpkin recipes seem like they have too many flavors going on, but this one is simple and classic and looks absolutely delicious. I’ll definitely be making this for the fall! Thanks for visiting Jessica! I hope you get the chance to try it. Hi I´’m a bit confused its 48 ounces??? Hi Andrea, it is four – 8 ounce packages of cream cheese. Hope this helps! I can’t wait to try your version and see his it turns out. Pumpkin cheesecake is king around here for the holidays! One thing I do instead of the water bath — and the cracked top without said water bath… I do not preheat my oven. I bake the cheesecake at 200 degrees for 3 hours and 10 min (sometimes even a bit longer 15-25 min if it is a smaller pan than 9″). Turn the oven off, crack open the door and let it stand until the oven is cool. Refrigerate overnight. Beautiful and a to-die for texture! This is just perfection. And gorgeous! The cheesecake looks yummy and I am going to try. How do I make the garnish that is on the top of the cheesecake. I just used a small star piping tip and piped around the cake. I hope this helps- thanks for stopping by! I have a 10 inch springform- any tips on how to adapt the recipe for this size? I think the extra inch will be just fine. I wouldn’t worry about it too much. “They tasted quite unfortunate.” Such a diplomatic way of saying “ewwwww!” Haha! Love this cake! I made your cake along with 4 other kinds for a prenuptial dinner at our home. The pumpkin was the favorite!! I’m making it again tonight for a party. The question I have is what do you use to make the stars on top….frosting? So happy to hear you enjoyed the cheesecake. I used a Wilton 1M tip to pipe whipped cream around the perimeter of the cheesecake. I hope this helps! Thank you so much for sharing so many good recipes, now I what to make one too! I have just one question, for that gorgeous frosting what tip did you use for piping? And is it with cream cheese frosting? You can get the pumpkin pie spice recipe here: https://www.mybakingaddiction.com/pumpkin-pie-spice-recipe/ Thanks for stopping by. I am making this cake right now:) not sure if your suppose to keep the crust in the pan to cool off or take it out but I tried taking it out and was afraid it was going to break so I left it in. Also I added a little of cinnamon,nutmeg,and cloves to the batter.. Let’s see how this will taste. Will update tonight. Making t for a little get together to see if it’s goid for thanksgiving :) I also used light cream cheese instead of normal cream cheese. I am glad you had the chance to try the recipe. I hope you enjoyed it. Thanks for visiting. At what point do you remove the cheesecake from the pan? Do I have to wait until after it’s completely cooled on the cooling rack to do that? You can carefully run a knife around the edges and remove the cheesecake ring before you refrigerate it. I hope this helps. This is a wonderful cheesecake that I have made and am planning on making for Thanksgiving. One question. Do you leave the cheesecake in the springform pan overnight or do you take the pan off once it has cooled to room temperature? I can’t remember what I did last time but it worked and wanted to get your opinion. You can remove the rim of the cheesecake pan once it has cooled. Have a wonderful Thanksgiving! I didn’t do the water bath, it cracked, WHO CARES!! Seriously the most delicious thing I’ve ever put into my mouth!! It was perfect and such a HIT at our office potluck! I followed the recipe to a “T” (minus the water bath) and the flavor was so fantastic I will bake this over and over! I am so glad the recipe was a success for you. Thanks for stopping by. Thanks for sharing… Problem with cheese cake is preservation…. How to handle this? You should keep it refrigerated. Thanks for stopping by. i think ice box is good for preservation in office & is good for travelling with cake. Your cake is looking very spongy in nature. Its decorations is good to make anyone impress. I m impressed with this cake. I am wondering if I can use 2 or 3 packages of cream cheese vs. 4? How will this change the flavor? Cutting back on the cream cheese will definitely make for a shorter cheesecake. You’ll also need to cut back on the rest of the ingredients as well. Could this recipe be made into mini cheesecakes? Im trying to find a good mini recipe for thanksgiving tomorrow! Hi, Rebeccah! These would be great as mini cheesecakes. I’d love to hear how they turned out! Second try of making a Cheesecake! Made one about ten years ago and it was a disaster! Video was wonderful! Cake chilling and not a crack except for my thumb imprint! Hoping it will be fabulous . Thank you!! Happy Thanksgiving!! You’re welcome, Ronda! I’m glad you enjoyed it. A few things: I probably will add a tad more spices. Second, I didn’t have a springform pan so I made it in a regular 9-inch pie dish. It turned out perfect but had enough filling for two cheesecakes. I did end up making a second cheesecake. The cooking time was exactly an hour, and I didn’t have any problems with my top cracking. This cake recipe looks promising and yummy. Will try to prepare this. What is the process for preservation? Hi, Keerthana! Keep the cheesecake stored in the refrigerator until you’re ready to serve. You can also freeze your cheesecake if you’d like for it to keep longer. The cheesecake can probably stay in the refrigerator for 4 days or so. I hope you enjoy it! Hi there I have made this cheesecake several times and it is always a hit. This weekend I was thinking of making it again but as mini cheese cakes. In that case I do I bake them? Hi, Amanda! You could bake the cheesecakes in muffin liners or a muffin pan. Bake for about 20 minutes or so. Once the cheesecakes have cooled, refrigerate for several hours. Let me know how it goes! Will try this. Love this recipe. I hope you enjoy it, Keerthana! How can I make this with fresh pumpkin puree? I see some recipes substitute 2 cups of fresh to one 15 ounce can. Would this work in your recipe? I also only have a 10 inch springform pan. Hi, Shelagh! You can definitely make this with fresh pumpkin puree. Two cups of fresh pumpkin should work. Try baking the cheesecake for about 45 minutes and check on it to see if it’s done to your liking. I hope you enjoy it! Is it ok to use heavy whipping cream instead of heavy cream in this recipe? Hi, Maria! I’ve not tried it, but I think heavy cream would be better. Heavy cream has more milk fat and gives a better consistency to the cheesecake. I hope this helps! Cheese cake is looking delicious, moreover your video explains everything and it encourage me to make it in my home, very very useful guide on making it own. I’m so glad! Give it a try…I think you’ll enjoy it! Hey Jamie, Just one quick question. If we want to deliver a cheese cake to some location which is around 1 hour far, then without refrigeration will cheese cake stay good? Hi, Amisha! I think the cheesecake will be fine, but I would adjust the temperature of the car or vehicle to help you out. Good luck! The cheesecake is heaven..A true beauty of a recipe. This is a good recipe, best cheesecake I have ever made. Made it for birthday and everyone loved it. Will be making again. Thanks, Jamie. Hi, Manoj! The garnish is whipped cream that’s piped on top. I hope you like it! Hi, Keerthana! A tightly covered cheesecake can be stored in the refrigerator for up to five days. The cheesecake can be stored for approximately 2 months in the freezer. To defrost, allow cake to defrost in the refrigerator overnight. I hope you like it! 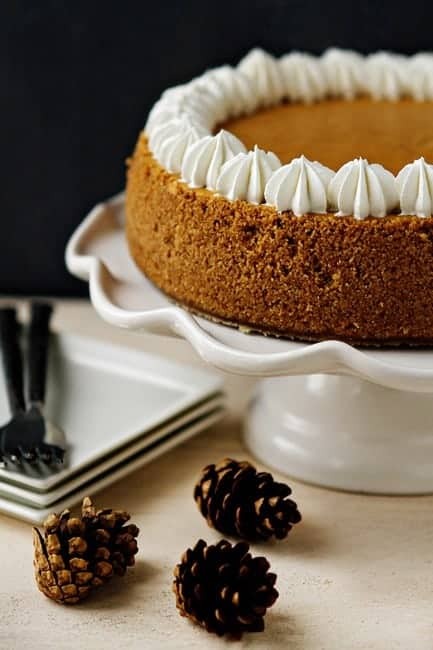 Pumpkin cheesecake is very tasty and I would say people try it once. It is very delicious and tasty. I have tried it many times. So happy to hear you enjoyed the recipe! Happy Holidays to you and yours! This Cheesecake is looking super delicious, moreover, your video explains everything and it encourages me to make it in my kitchen, the very very useful guide to making it own. I’d like to watch your video but can find it here is there a link with it? Here is a SUPER old video on cheesecakes that I posted on youtube years ago. Thanks so much for stopping by, Nidhi! I appreciate you taking the time to comment. Happy Baking! This recipe was the best! No water bath , but no cracks! Thank you! So happy to hear you enjoyed the cheesecake, Elaina! Thanks so much for stopping by and leaving your feedback!